The sign was inspired by the memoir of former Virginia Gov. Linwood Holton who greeted his children with that message every day. A desire to create opportunities for others plays a big role in Bland’s roles as a businessman and a civic leader. He has been a major restaurant franchise owner for 33 years, but he also is heavily involved in many educational, community development and civic organizations. 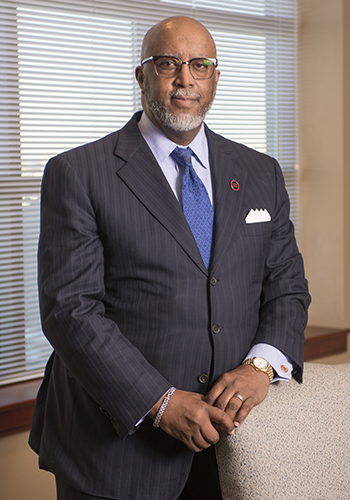 Last year, he became president and CEO of the Urban League of Hampton Roads, helping to rebuild it while also serving on the boards of a half dozen other nonprofit groups. “My passions on the personal side are family and faith, but on the professional side, it’s civic and professional engagement and being an employer,” he says. Since 1985, GilJoy has owned and operated more than 70 Burger King and Pizza Hut restaurants employing more than 2,000 people in Virginia, North Carolina, Pennsylvania and Washington, D.C. Most of those restaurants have been sold, but the company, which now has 60 employees, still owns sites in Hampton Roads. Bland has been a leader among Burger King franchisees. He served on the board of directors of the company’s National Franchise Association for 10 years and was elected to five terms as president of the Burger King Minority Franchise Association. He also is a charter board member of the Burger King Inclusion Advisory Committee. Inclusion also is one of Bland’s goals at the Urban League of Hampton Roads, which under his direction has begun several projects to assist the region’s African-American community. “The Urban League movement is all about empowering minority citizens,” he says. In addition to the Urban League, Bland also serves on the boards of the Virginia Chamber of Commerce, Virginia Museum of Fine Arts, Randolph-Macon College, the Hampton Roads Community Foundation and Sentara Healthcare. He is chairman and president of Healthy Neighborhood Enterprises, a community development corporation in Norfolk, and was recently named a member of the Governor’s Virginia Complete Count Commission, whose goal is to improve the participation and representation of Virginians in the 2020 Census. Bland is the former chairman of the State Council of Higher Education for Virginia (SCHEV), where he served on its executive committee for seven years. Bland’s past board service also includes the Old Dominion University board of visitors and the James Madison University Foundation. “Education is a gateway of opportunity for most Americans, particularly minority Americans,” Bland says. He speaks from experience. Bland grew up in the Dahlgren area of King George County where he played on a state champion high school basketball team. “My dad only went to seventh grade, and my mom was a high school valedictorian who ended up being a maid all her life because of the times,” he says. Bland worked his way through college and graduate school. He earned a bachelor’s degree in accounting and economics at JMU and an MBA from Atlanta University. Bland began his career as a commercial lending officer for the Continental Bank of Chicago. He later served as a vice president for commercial lending for the Independence Bank of Chicago before becoming a Burger King franchisee. Burger King Corp. presented Bland with its James McLamore Founder’s Award for outstanding contributions as a franchisee and endowed a scholarship in his name at JMU. He also has received an honorary degree from Longwood University for his service on the SCHEV board. In addition to his two teenage sons, William and Samuel, the Blands have three adult children: Robert, a college professor; Allison, who works at Princeton University; and Libby, an architect and city planner. Virginia Business: Why did you decide to become the president and CEO of the Urban League chapter? Bland: Urban League has four major pillars: housing, education, health and workforce development, all four of which I have spent most of my professional life directly engaged in. Secondly, it is the oldest civil rights organization in the country, and the Urban League movement is all about empowering minority citizens. I find that wholly and perfectly aligned with my own personal goals. Thirdly, our chapter is experiencing opportunities to be relevant and remain strong. I thought I had the opportunity with the various boards and affiliations that I’ve been associated with … that I could bring some assistance to the existing team and board. VB: How big is the chapter’s employment and its membership? Bland: Membership is probably approximately a thousand. Our employee base fluctuates. I’ve spent the year rebuilding our organization, that is, in examining all of our expenses. We have been in a slow-growth mode in terms of growth of employees but more importantly, a growth to right size the organization for its revenues and expenses. We are now a profitable organization, which I’m very proud of. That requires some paring of expenses, but we’re now in a building mode and looking at a number of programs, some national, some local in partnership with many other major brands and companies … I believe in 2019, we’ll begin to see the fruits of the planning initiatives of 2018. VB: W hat is your overall objective with the chapter? Where would you like for it to go? Bland: Our chapter in Hampton Roads has unique opportunities. We are the 13th-largest African-American population in America, and African-American citizens represent 33 percent of the region’s population. It’s an opportunity to empower through investment, through programs, through partnerships to ensure that these citizens, from pre-K to the elderly, have an opportunity to engage. I think I would view [the chapter’s efforts as successful] if we were able to comfortably and honestly say that our citizens are fully integrated into the community of Hampton Roads, because I think it will provide a greater workforce, an improved workforce. I think it will allow for more philanthropic contributions and overall a better community. VB: L et’s talk a little bit about some of the [Urban League] projects that you’re involved with. Bland: One of the promising partnerships is with LISC, the Local Initiatives Support Corp., a national service group that’s headed by Maurice Jones, the former [Virginia] secretary of commerce. We are looking to establish financial opportunity centers that would provide counseling and coaching. We have an opportunity to join the Hampton Roads Workforce Council, an organization formally known as Opportunity Inc., to do this. We will be one of the largest financial opportunity centers in the nation. We plan to do it both on the south side of Hampton Roads, as well as for the Virginia Peninsula. Secondly, I serve on a board of Sentara Healthcare, and one of the great pursuits of the health-care industry in general is understanding the social imperatives of health. The quality of life and longevity of life is often tied to the ZIP code where you were born, which obviously we can’t control. Health-care organizations are looking to invest in initiatives that involve nonmedical intervention. We believe that only 10 to 15 percent of the quality of life and lifespan is [affected by] medical intervention. The rest is lifestyle choices. Sentara has announced a number of initiatives they’re exploring. They’re looking to work with Urban League to invest in our four pillars. That’s a grand opportunity. Another exciting opportunity is the Hunton YMCA, [in Norfolk], the oldest Y in the nation continuously serving African-Americans … We have an opportunity to join with them to help rebuild their finances and organizational structure and also be a home for more of our programs. It’s in a rapidly changing neighborhood in Norfolk known as the St. Paul’s Quadrant, which is about to undergo a major evolution of reconstruction. It all joins together because we will be able to engage with those citizens for the financial opportunity center, as they are making lifestyle changes and relocation changes. VB: Going back to the GilJoy Group, you’ve sold most of your restaurants now? Bland: I have been a franchisee of two major global brands, Pizza Hut and Burger King, for nearly 35 years and would never be interested in completely exiting the system. We have sold the bulk of the restaurants. We remain in Norfolk with a few, and we’re always looking for opportunities to grow our business. I would add that at one point as an employer we had over 2,000 team members and operated in three states. It was one of my great passions to work with those team members, provide them professional opportunities and help them meet their goals, as well as build a business and sell the products of those two major global brands. VB: You were a commercial banker in Chicago before you became a Burger King franchisee in ’85. What made you decide to make the switch to become a franchisee? Bland: I attended James Madison University and received an undergraduate degree in accounting and economics. I then went to graduate school at Atlanta University, which at the time was the only accredited MBA program at a HBCU [historically black college or university]. Our professors urged us to consider entrepreneurism, and that path was generally through either accounting or banking. We’d have the opportunity to learn about a variety of businesses. I embraced that and chose banking with the clear goal of becoming an entrepreneur. I went into commercial lending for seven years and had an opportunity to become an entrepreneur starting at age 29. VB: A re franchises a good choice for minority entrepreneurs? Bland: It’s an often-repeated phrase, but I believe fully that: You’re in business for yourself, but not by yourself [as a franchisee]. What you’re essentially purchasing is a template and a successful business model that you have opportunity to then put your own personal imprimatur on and build a business. That’s exactly what occurred for me. I bought an existing business system. VB: Y ou served on the Burger King National Franchise Board and then you were the president of the Burger King Minority Franchise Association. Can you tell me a bit about those experiences? Bland: I find board work to be one of my great passions. My passions on the personal side are family and faith, but on the professional side, it’s civic and professional engagement and being an employer. What I found with those boards was the opportunity to apply the same managerial skills that I used in my business along with some highly successful peer-group members. It’s an opportunity to make a difference. We were advocates for other minority franchisees in the Minority Franchise Association, as well as the community. It allowed me at an early age to gain exposure to national opportunities and a national forum, as well as working with peers that I learned from. VB: I think you’re on the board of about seven [nonprofit] organizations at this time. Tell me a little bit of what attracted you to these various groups. I’m president and CEO of a community development corporation known as Healthy Neighborhood Enterprises. We operate out of one of the urban neighborhoods in Norfolk, Park Place, and through our investments and being a catalyst for private investment, we have watched the trade areas that we focus on completely turn around in terms of neighborhood engagement with their properties as well as home prices. It’s been a very successful venture … We’ve seen a reduction in crime, and we’ve seen significant increase in home values. Equally important, we have seen a greater pride in the neighborhood. The true measure of success is when the private sector comes in and competes with us in the purchase of properties. We’ve done our job at that point and can move on to the next neighborhood. VB: Now, your latest appointments were to the VMFA and the Complete Count Commission. Tell me about that. Bland: [At the VMFA] it is the opportunity to be another voice to ensure that, because it’s a publicly owned institution, exhibits and initiatives are far-reaching in the community and to work with yet another very strong team of administration and board members. With the Complete Count Commission, I find that especially interesting. [The commission complements] my role as president and CEO of the Urban League to ensure that all minorities are counted completely. It has a far-ranging impact … Undercounting means less funding, it means a different kind of legislative representation, so the count is important for a lot of reasons, and it’ll be interesting to see how we work through that. VB: Is there any one project of which you’re particularly proud of that you’d like to talk about? Bland: I’d say two. As an employer, to employ 2,000 people at one time was not only a learning experience about the lives of our team, but also a unique opportunity to help them reach their goals. On a civic side, clearly the State Council of Higher Education, where we had opportunity to build upon an already great educational system. We created a strategic plan while I was chair that was 18 months in the making... did it all in full transparency, because every meeting that we had, the public was invited, including any phone call with more than three people. To do this important work with the full transparency to the public, I thought was unique.